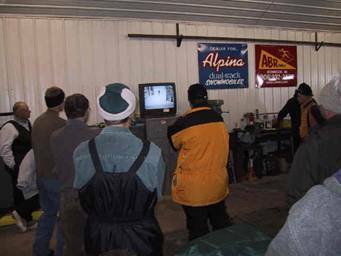 This year ABR again hosted the Midwest Grooming Clinic endorsed by the CCSAA on January 16th and 17th, 2002. We had 122 groomers and vendors turn up for the occasion…. from Canada to lower Michigan, from Montana and Colorado to Italy. A video was taped and is being edited of the clinic. Call or email for details. There were many sales as a result of the Clinic. Vendors came with trucks and trailers full and left empty. Please support these vendors and tell them you saw their equipment at the clinic. The heated “Race Building” was used for vendor’s displays with boards for used equipment for sale and innovative ideas. Russ Alger of The Keweenaw Research Center at Michigan Technological Univ. Eric Anderson of ABR Trails. Do not get out of your snow cat with the tiller running and always set your parking brake. Thermoses on the front dash may end up breaking a $1500 windshield. There are 3 suspension adjustments to make your Skandic SWT steer better, or a front weight rack and flexi skis. If your lights get bright and or your handle grips get hot, your voltage regulator is on it’s way out, turn off the machine and replace it (the regulator). Carry a fire extinguisher under your seat. We saw and test drove the Alpina dual track snowmobile. It has tons of torque and traction plus it steers like a dream. It was built for hard work. The pull behind powertiller tilled some man made ice and set tracks like it was butter. The Alpina pulled the 8 foot wide Cragin groomer though deep snow with 4 men (1000 pounds) on the Alpina and steered as it climbed a hill! Orders for the Alpina should be made this spring for October delivery. 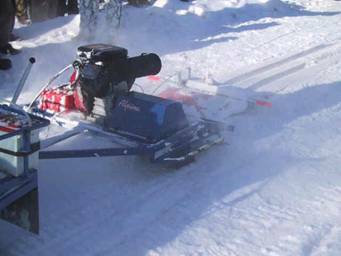 These specialty machines are built to order similar to snowcats. Alpina now has ABR Trails as the Midwest dealer and Importer for the US. Call ABR for a demo of the Alpina. A video is available. Various discussions on how to conserve snow by not grooming, using JACA grabber wings to pull snow in or just scarifying the surface lightly so not as to bring up dirt. 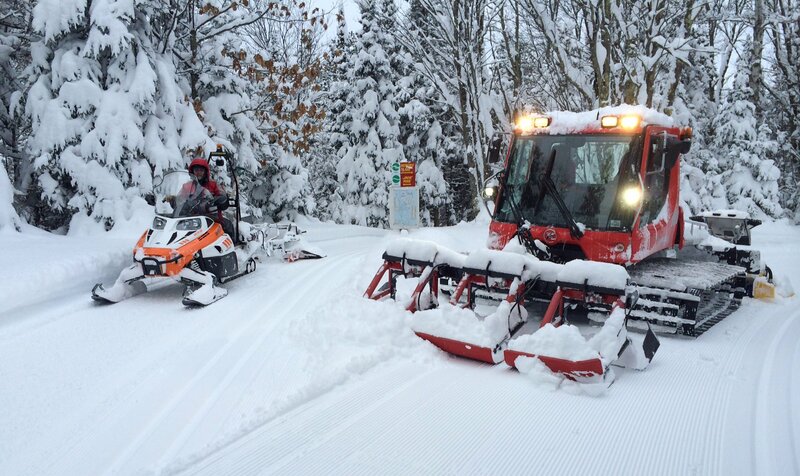 Use your snow cat with a compactor bar and have the tracks loosen up the hard pack. Be sure the ground is frozen or you will bring up dirt. Dave explained how he only uses snowcats and grooms in low snow. He only opens weekends and holidays and saves the weekday snow. He pulls moulding plates and rollers behind his snow cats and he runs a very reputable, professional and meticulously groomed private trail system with an $18 trail fee 1 hour south of the Mackinaw bridge in Frederick MI. An open session discussing various grooming scenarios for different conditions. This was a particularly interesting open discussion, coming up with solutions and ideas for grooming in different low snow conditions. Till deep enough to set tracks, keep your shaft speed down to not over till and have a rock hard surface, use “up pressure” on hill crests and intersections. 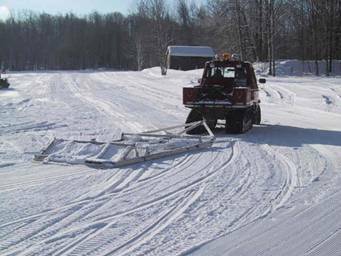 Use summer tracks for early season grooming. If you overgroom your snow you end up with “sugar snow”. 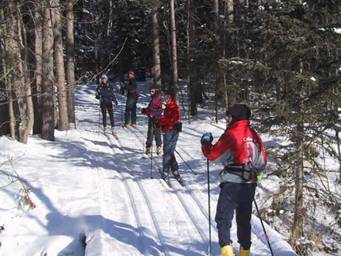 The miller is under development for Nordic ski trails. 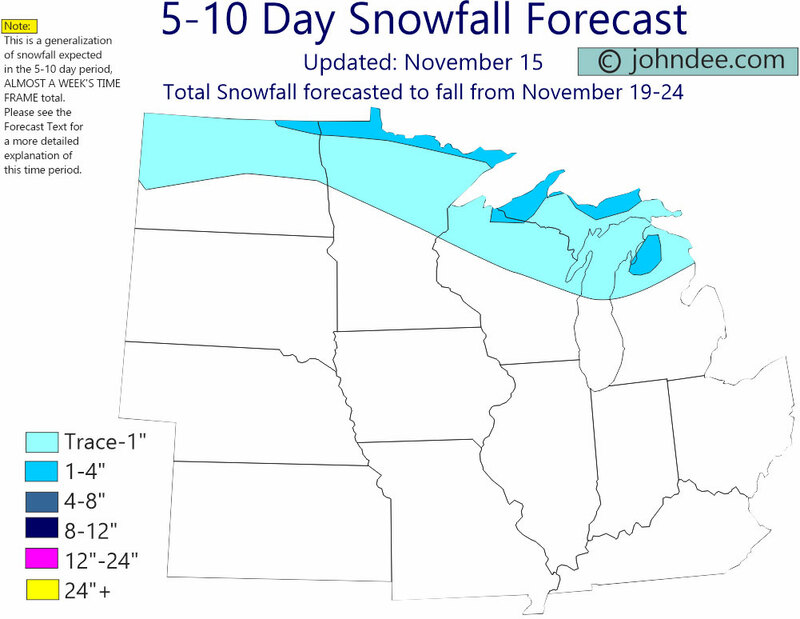 If it’s snowing at midnight the night before the JO’s sprints, you will not get any sleep. These young athletes deserve the best course possible. 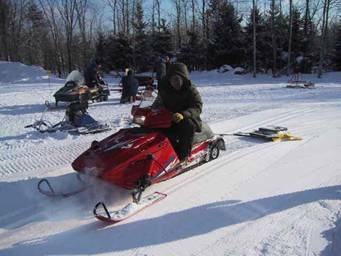 In a open windy golf course sprint course pack channels upwind with your snowmobile to catch the blowing snow and keep it off the course. Don’t forget the warm-up loop, groom it as you do the course. 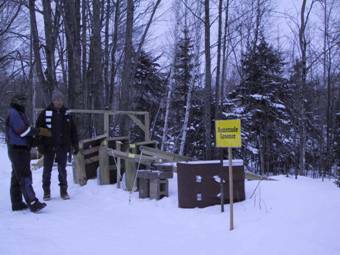 Bring out the snow fence drag and snowmobiles when your course turns to mush and the 3 snowcats are stuck at the 6 km mark of a World Cup event during warm grooming temps. Groom when the air is cooling and moisture is evaporating. Make sure your battery and alternator can handle the loads of your actuators and aux lights. Always fuse the aux equipment. Cole Hearsey makes a nice 2 pol;e self centering switch with a long handle. There is no black box to evaluate snow conditions. Talk to your skiers and ski your trails. Try hard with 100% effort, but remember you can not please everyone, try to please 80% of your skiers and 20% of the coaches. Test your grooming by skiing it and look at the tracks of the skiers skiing them. Alternate the track from the left to right in dual tracked trails on down-hills. Do not track through your intersections. We had a nice banquet dinner at Tacconelli’s with the social hour paid for by Track Inc /Pisten Bully Dealer. Russ Alger followed with a 1500 Mile Trek Across Antarctica Slide Show. Alpina hats, Pisten Bully hats and a Pisten Bully jacket were given away to some technical question answers. An authentic Pizzocheri (hearty wholewheat pasta) and grilled Cottechini (Italian mountain sausage) was prepared and sponsored by Alpina dual track snowmobiles. What did we see, touch and drive? The Bachler renovator and tracksetter and the new ginzu groomers from YTS, the full Tidd Tech line up including new 8 foot roller, super flaps and actuators from Tidd Tech, the full line of JACA equipment including a set of grabber wings, renovator and hi speed tracksetter, the new Alpina dual track snowmobile and powertiller, The xcskigroomers.com tracksetter, the 8 foot wide aluminum Cragin groomer, The PB100 and 070, Bombardier’s BR 180 and Prinoths T2S, ASV’s Track Truck, Ski-doos SWt and WT’s, an older Alpine II, and various homemade attachments. Thank you for attending the grooming clinic. When we started planning the clinic, last April, we had hoped for 30 attendees. We ended up with 124! The idea was prompted after I attended a grooming clinic at Frisco and Breckenridge Nordic Center, 1400 miles to the west. The clinic cost, with transportation, lodging and hotel, was over $2,000. There were 15 –20 participants, including 3 presenters, and the clinic was 1 ½ days. I still thought what I got out of the clinic was worth it, but I did see a need for a clinic closer to the Midwest. According to the registration forms, we had 986 years of grooming experience gathered in one room. We are already planning another clinic for next year, tentative date Jan 16-17, 2002. We have enclosed an evaluation form to help us improve the clinic, please fill it out and return it. As a wrap up I would like to summarize the events over the clinic and the vendors that attended. Email me if you are interested in future grooming clinics, workshops or publications. Wednesday started out with 8 inches of fresh snow and about 20 degrees. 9-12, we had on snow demos from Piston Bully with a new 9 foot PB100 and Bachler /YTS Front Renovator, a 9 foot tiller and twin Bachler tracksetters. I also demo’ed ABR’s PB 200 with a 12 foot tiller. Bombardier demonstrated the new BR 180 with a front blade. 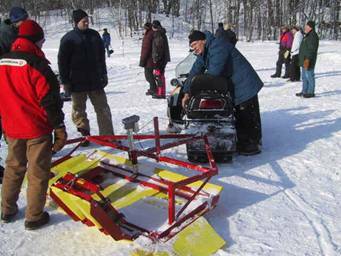 Snowmobiles and grooming attachments were available for demo during this time. The Race Building/Wax room was set up with brochures from vendors, product samples, groomer innovations, homemade accessories, a “For Sale Board” (see below) with used groomers, and videos playing grooming tapes. 1:00-4:00 we met at the Erwin Town Hall (just down the road) and had a sit down lecture/discussion. Our first speaker was Russ Alger from the Kewenaw Reasearch Center at Michigan Technological University who spoke on “snow” from a technical level and on the research they are doing. KRC has a research tool that compacts snow to .68 density. Paul Swanson spoke on power tilling and on the models of Piston Bully, Eric Peterson spoke on Bombardier. Doug Edgerton of Yellowstone Track Systems and George LeFeuvre spoke on grooming for races and some of their experiences grooming Olympic Events around the world. Eric Anderson of ABR spoke on buying a used snowcat. 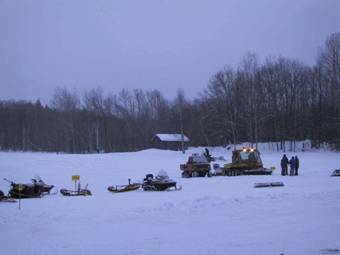 4:00-6:00 we returned to ABR and had open grooming and open skiing, the skiing was not too good since most of the grooming demos occurred close to the trailhead! 7:00-10:00 we met at Mama Get’s Restaurant and enjoyed dinner and drinks we had some casual grooming discussions. 9-11 we observed some on snow demos. Doug Edgerton demonstrated setting tracks in the parking lot with the Bachler/YTS renovator and tracksetter pulled by an Artic Cat Bearcat 550, liquid cooled. With multiple passes a track penetrated the hard pack. 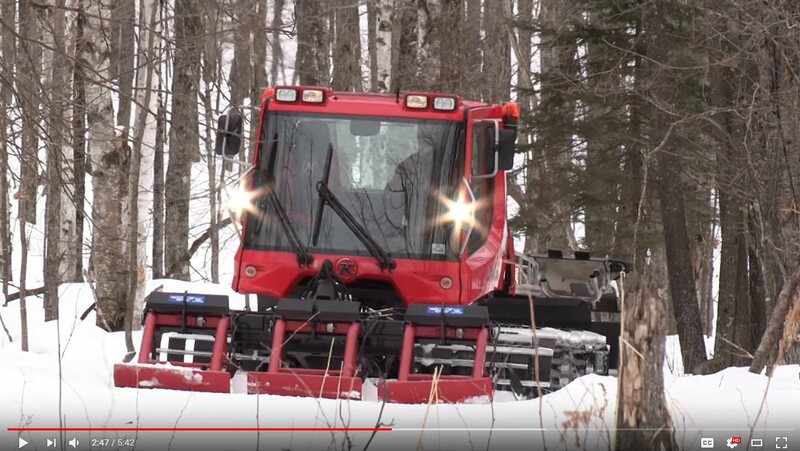 Phil Zink of Tidd Tech set tracks with the Trail tenderizer and David Zink of Tidd Tech demo’ed the features of the groomer and the most recent innovations. We also saw the new roller, and packer tracker. 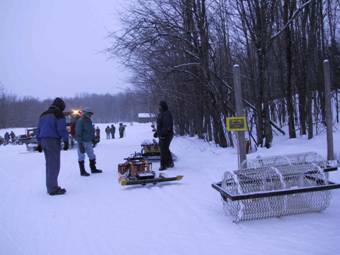 Bob Cragin of Cragin Machine demonstrated the Cragin groomer (aluminum) 8 foot wide and 12 feet long weighing only 300 pounds. ABR trails were groomed Thursday AM with this drag pulled by a SWT . Rick Slade of Ave’s (Ski-doo Dealership) demonstrated the suspension adjustment on the Ski-doo Skandic SWT and initiated discussions on steering the SWT. 11-12 Show and Tell, we looked at some homemade drags and accessories brought by participants. Make sure to judge the best homemade idea on the evaluation form. 12-1 lunch consisted of traditional “Yooper Pasties”. 1:00-3:45 Lectures/discussions at the Town Hall. 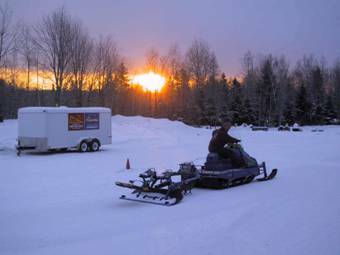 We heard from David Zink of Tidd Tech on early season trail prep and getting the most out of your snow. 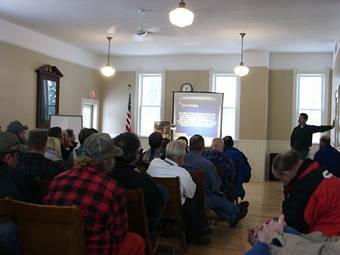 Eric Anderson of ABR led a discussion on grooming costs for Snowcats and snowmobile grooming. 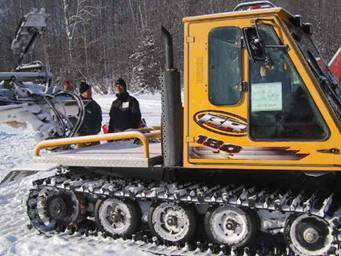 The final costs were, snowcat grooming $60/hour or $15/mile and snowmobile grooming costs were $5/mile. Eric also spoke on deep snow grooming. Doug Edgerton and George LeFeuvre spoke on setting a good track, while Jim Waters, a physics teacher and classic skier, expressed what makes a good track. Groom for 85% of your customers, you cannot please everyone. Hard to steer the SWT? Buy $400 aftermarket skis, add weight to the SWT bumper, or adjust the suspension, there are 3 suspension adjustments. Use a renovator to mix old and new snow. You need weight, slow speed, and proper snow preparation to set a good track. Pack track with your snowcat before tilling deep snow. Do not finish groom (lay corduroy) over a surface that is not compacted properly, it will freeze a superficial layer with a soft layer below. Drag/roll and compact the surface first! Snowmaking on Nordic trails is expensive! NEVER get out of your snowcat with the tiller running!